I had never heard of the German Modernist painter Paula Modersohn-Becker before picking up this slim account of her life by Marie Darrieussecq, and I read the book through to the end before I thought to look up images of her art online. I’m still ambivalent about many of them, in their reduced, digital form at least, but that didn’t spoil my enjoyment of the book, which I found both moving in its content and thrilling in its approach and execution. Modersohn-Becker is not widely unknown, outside Germany at least; there are exhibitions, from time to time, and a biography and a monograph in English, but Darrieussecq’s book is primarily a work of recuperation, and avowedly so. Like Nathalie Léger’s Suite for Barbara Loden (Les Fugitives), about the American actor and director, it is not just a work of scholarship, but a creative act, a tribute from one artist to another. Indeed, a tribute from an artist lucky (or privileged) enough to have lived to see success, to one who died before she could produce all she was capable of. 1900 was also the year that Paula met the poet Rilke, who was visiting the artists’ colony in Worpswede, where she was a regular. Their intense friendship survived, on and off, for the rest of her life, through letters, exchanges of their work, and frequent meetings. Rilke, whom she painted, and who wrote the poem ‘Requiem for a Friend’ about her on the first anniversary of her death, was, of course, less exclusive in his intensities, especially with women. In fact, he married Paula’s friend the sculptor Clara Westhoff (disastrously). Paula married one of the Worpswede painters, Otto Modersohn, in 1901, only to leave him five years later, returning to Paris to paint. In 1907 they were reunited, and Paula became pregnant. She died of an embolism, weeks after the birth of her daughter. She was 31 years old. Her last word, after her collapse, was “Schade”: what a shame; what a pity. It’s that sense of pity and waste that drives Darrieussecq’s book, the sense of injustice both in the conditions of women artists’ existence at a time when art and society were taking great bounds forward, and in her treatment since. Why hasn’t everyone heard of Paula Modersohn-Becker? She was, Darrieussecq points out, the first woman to paint herself naked, the first woman to paint herself naked and pregnant. It is this forthrightness, this political claim-staking, as much as the revealed facts of Modersohn-Becker’s life, that make this such a striking book. It is striking enough in its presentation. Darrieussecq writes in fragments, skipping through the parts of the life that tell her nothing she needs to know. She drops in references to her own life, her own work, her take on what she sees in the paintings. (The translation, by Penny Hueston, is as clear and unfussy as the original.) Darrieussecq complains that the Museum Folkwang in Essen is hiding its sole Modersohn-Becker in the basement, along with work by other woman painters. A footnote says the museum later moved the painting upstairs. Another (translator’s) footnote tells us that, thanks to Darrieussecq’s book, Paris saw its first major retrospective of Modersohn-Becker last year, at the Musée d’Art Moderne. The act of recuperation does not merely benefit its subject, brought finally into the light; the benevolence reflects onto the recuperating agent, and refracts outwards to the reader. You feel better for having read it. It is constructed so well that you feel better reading it, too. Marie Darrieussecq published her first novel, Pig Tales, in 1996 at the age of twenty-seven, and it became an overnight sensation and bestseller, selling more than 300,000 copies and translated into more than thirty languages. The New Yorker described her as France’s “best young novelist,” and she is recognized as one of the leading voices of French contemporary literature. Her novel Men was awarded the Prix Médicis and the Prix des Prix in 2013. Penny Hueston is a Senior Editor at Text Publishing. 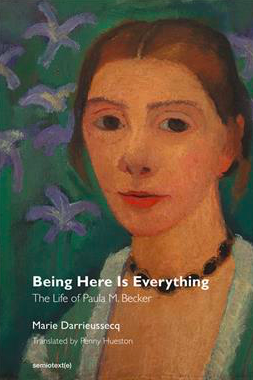 Being Here is Everything: The Life of Paula M. Becker is published by semiotext(e). Author bio courtesy of the same. Posted in Book reviews and tagged German Modernist painting, Marie Darrieussecq, Paula M. Becker. Bookmark the permalink.